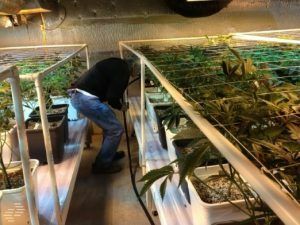 With the legalization of marijuana in several states, and potentially more to follow in the next years, much focus has been brought to bear the plants growing practices. Of course the simplest method of growing the cannabis plant is to ignore the plant while it grows and later have your cannabis harvest it once it is ready. Where the problem lies with this system is that the simplest method is not necessarily the most efficient growing method. 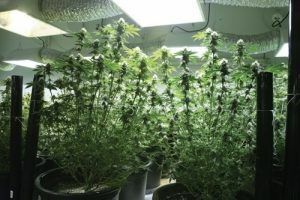 Several different growing methods have been proven to increase the productivity of your marijuana cultivation, with varying degrees of complexity in their installation and upkeep. As you can see in this example, the cannabis plant can grow quite large. The cannabis plant, if planted outside in the soil with plenty of sunlight, is left to its natural tendencies, will grow into a healthy plant. There are a few problems that arise when using this growing method however. One of these problems comes from the fact that the marijuana plant can potentially grow upwards of six meters tall. This poses the very serious issue of making the cannabis harvest very difficult if not effectively impossible without killing the plant in the process. The other main issue is that when left to its own devices, the marijuana plant will grow into a shape similar to a Christmas tree. This would not normally be an issue by itself, but the marijuana plant happens to grow its best leaves near the top of the plant. If the cannabis plant has a Christmas tree like appearance, there will only be one main stem that goes all the way to the top, reducing the size of the highest quality harvest. Properly pruned, multiple stems form, allowing a greater harvest. As has been shown, letting the marijuana plant grow left to its own natural tendencies is not an optimal use of space or resources. In order to get the best possible cannabis harvest, it is very important to prune the tops of the marijuana plant while it is still growing. This turns the overall shape of the plant from its original Christmas tree shape, into more of a bushy squat shape. This is of great benefit to the grower, as instead of having a solitary main stem, there will be multiple stems with a high quality bud at the top of each. In almost every aspect, this will improve the beneficial traits of the marijuana plant. The drawback that is associated with pruning your marijuana plant is a consequence of the bushy shape instead of the Christmas tree shape. When the plant has one central stem, the plant can grow that stem fairly thick and can easily support the weight of the plant in all directions around that central stem. When pruned, the stems that start growing do not have the same structural support, causing them to bend from their own weight and potentially spoiling harvests if they are allowed to touch the ground. A high quality trellising net supports the weight of the stems. Since allowing the plant stems to touch the ground is a serious problem, but the benefits of pruning the cannabis plant far outweigh the drawbacks, growers have applied a trellis netting system to growing marijuana that has been in use with normal crops for several years now. This trellis netting system is either placed as netting above the plants, or placed around the sides of the plants. In either case, the bushes are allowed to grow, and since they now have the trellis netting to support their weight, there is no longer the risk of the stems being unsupported and falling to the ground. A side benefit of this is that this system allows optimal light coverage to the topmost parts of the plant, where the best buds will grow, letting the grower prune the lower leaves which not only drain nutrients from the plant, but would not grow sufficiently good buds in the first place due to their placement. As has been shown, the benefits of pruning marijuana crop far outweigh the drawbacks of letting them grow as they please, and the best way to support your cannabis harvest as it is being grown and pruned is to use a plant support system. This is a recompilation of material freely available on the internet. All sources of information are linked in the following bibliography. Disclaimer: This information is intended for educational use only. Check with your local authorities about local cannabis growing laws. We do not pretend to give legal advice about the legality of cannabis in any area, nor are we qualified to give any legal advice. Similarly, we do not assume any legal responsibility for any actions taken by anyone. The information provided is a recompilation of what is publicly available on a regular internet search. In addition there are some videos showing the similarity of some agricultural practices that are practiced in this and other types of cultivation. 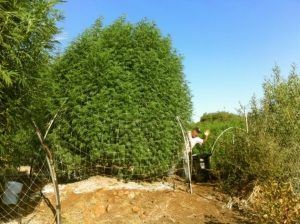 How to increase your cannabis harvest, especially compared to letting your marijuana plant grow naturally, by pruning your plant and using trellis netting.